Is Bingo Small for a AA Franchise? Recently a Binghamton Mets fan commented that AA is a high level of ball for a community the size of Binghamton. Is that true? 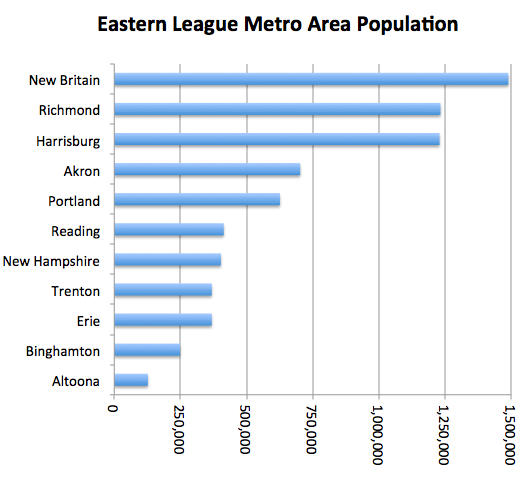 Let’s take a look at the populations of the metro areas in the Eastern League. The whole metro-area thing is not an exact science, but I think most of the EL cities are reasonably represented. I used a list on Wikipedia that has 2012 population figures. New Hampshire is represented by Manchester, and New Britain is represented by Hartford. The only real choice for Bowie is Washington. Bowie is a bit of an anomaly in the Eastern League, as it’s the only location that very close to an MLB city. The metro-area populations are shown in the chart below. Bowie is not included, because Washington’s nine million population is off the charts. I’m surprised that New Britain/Hartford is the largest (apart from Bowie/DC). Anyway, the fan was correct: only Altoona has a lower population than Binghamton. I’ve been to Altoona, and not only is it fairly small, but it’s also pretty isolated. I can’t imagine that many people make the trek from Pittsburgh or State College. It’s a fairly new site for organized baseball (1999), and their attendance is relatively strong. Well done, Altoona! 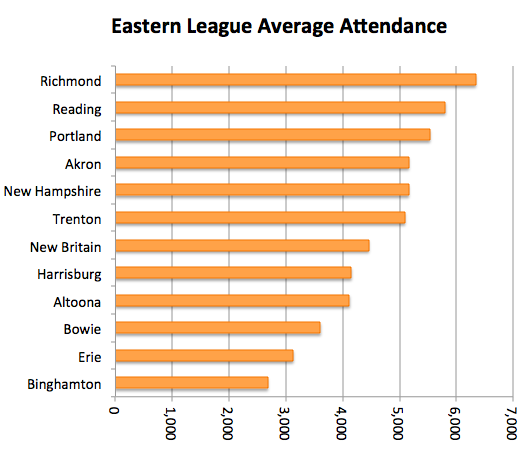 Speaking of attendance, the average EL 2014 home attendance is shown in the chart below. Binghamton’s place in the cellar may play a large role in the possible demise of the franchise, but it’s been fun while it’s lasted!